Market Rasen MP Sir Edward Leigh has vowed to petition the government for improved rail links in the town after an announcement the service is to be nationalised. Stagecoach and Virgin Trains services on the East Coast Main Line will be brought back under public control on June 24, and trains will be run by London North Eastern Railway (LNER). Talks had been under way with Virgin Trains to secure direct rail links from the Humber South Bank to London, with services passing through Market Rasen. But Sir Edward does not think the end of the franchise agreement will damage this bid. 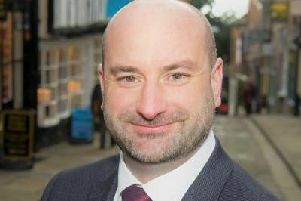 He said: “I’m not convinced that it really matters to local people if the train services, available from Market Rasen railway station, are provided by a company in public or private ownership. “What we all surely agree upon is the need to improve the current rail services? “We want decent through services south to Lincoln and north to Grimsby and direct connections to London, as we had in the past. Sir Edward, West Lindsey District Council and the Hull and Humber Chamber of Commerce had thrown their support behind efforts by Cleethorpes MP Martin Vickers to restore direct rail links to the capital. Mr Vickers had been in talks with the train companies in an attempt to restore rail services which are seen as increasingly important in light of the growing renewables industry in Grimsby, and the Port of Immingham expansion. Transport secretary Chris Grayling made decision to nationalise the service, saying the franchise had failed. The Department for Transport will run East Coast Main Line services until a public-private partnership can be appointed in 2020. In a statement to Parliament, Mr Grayling said: “I don’t want these changes to be of anxiety to passengers.